This poignant, romantic Russian masterpiece follows the lives, loves and dreams of sisters Olga, Masha and Irina. Living in a stifling provincial town they long to return to Moscow where they grew up and were happy. But they find their hopes for an idyllic life at odds with the relentless real world changes closing in on them. 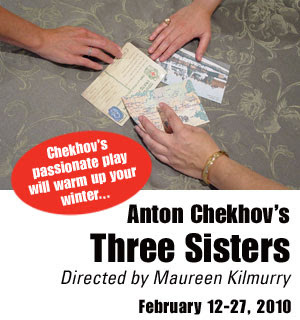 Chekhov’s passionate play will warm up your winter! Guarantee your seats to an unforgettable theatrical adventure—Call Today!